Objectives and team perspectives are now used to build a conceptual model. The team examines the cause-and-effect relationships among all factors of the problem. For example, they note that seeds from Japanese stilt grass could move in on the wheels of mowing tractors, or that manual labor can be time consuming and expensive when the target area is hundreds of acres. They brainstorm together and document many issues that are a part of the larger problem, while discovering opportunities and uncertainties that they hadnt thought of before. As this discussion proceeds, the team talks about available data and key uncertainties. 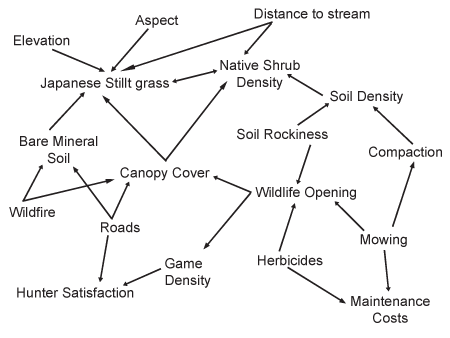 They decide to initially compile four data layers that will help them with their project: canopy cover, elevation, aspect and distance to streams in the sub-watershed. Previous research in this watershed has shown these variables to be useful predictors of invasive plant distributions. This GIS data will be used in conjunction with belief networks later in the CRAFT process.